A powerhouse, multi-effects processor with next-generation amp modeling in a rugged, roadworthy floorboard unit. The long-awaited follow up to the GT-10 has arrived. Meet the new BOSS effects flagship, the GT-100, boasting next-generation amp modeling that recreates vintage amps as well as providing new COSM® tones that soar into the future. The user interface has been improved with a unique dual-LCD system, and EZ TONE has been enhanced with newly designed AMP CUSTOMIZE and OD/DS CUSTOMIZE features. The GT-100 is a powerhouse processor that spans from classic to futuristic in a friendly, rugged, road-worthy unit. With its next-generation COSM processor, the GT-100 ushers in a new era of expression and sonic capabilities. Recreating the meticulous details of vintage amps and how they behave, the GT-100 excels in not only cloning classic amps, but provides a new world of unimagined tones as well. The AMP CUSTOMIZE function lets you mutate classic amps beyond reality. Construct completely new, unimagined sounds! 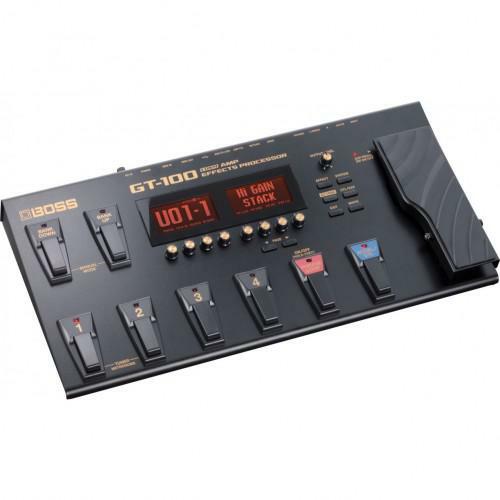 The GT-100’s unique dual-LCD and eight-knob user interface provides fast access and intuitive control. There are no menus to navigate; every function is instantly available. The tone-customizing functionality has been improved as well. All patches, amps, and overdrive/distortions can be created from scratch and/or customized with the friendly graphical TONE GRID. Maximum height: 102 mm, 4-1/16 inches. *1 AF method (Adaptive Focus method) is a proprietary method from Roland & BOSS that vastly improves the signal-to-noise (S/N) ratio of the A/D and D/A converters.